You might have seen some of my 2017 Disneybounding ideas and I'm pleased to say that we have recently booked our next family Disney trip! It's not until spring 2019, after our new baby is born, but I'm already thinking of all the bounds I can put together and wear, this time I wanted to do some couple bounds too and Dan has (reluctantly) agreed! Disney are welcoming their 'Summer of Superheroes' this year, so we will miss out on that (boo!) but they are slowly starting to design and integrate more and more permanent Marvel attractions into the park so I really wanted to try a captain america bound. It's inspired by the man himself as well as the vintage vibe from his backup chorus shown in the Captain America; the first Avenger movie. I find wedges very comfortable and have worn them for a day about London a few times so I'm confident that these shoes will be a good - and sensible- choice, but if you're not keen on a heel you could try a white or red pump instead. I also have a navy cardigan handy for if the clouds decide to show up! As much as I love to keep my bounds inexpensive, I have decided to add the iconic Besame Victory Red lipstick to this bound - it's a true replica of 1940's shade and I have wanted to own it for the longest time now, so this seemed like a perfectly good excuse! The first of our couples bounds is Rapunzel & Flynn. 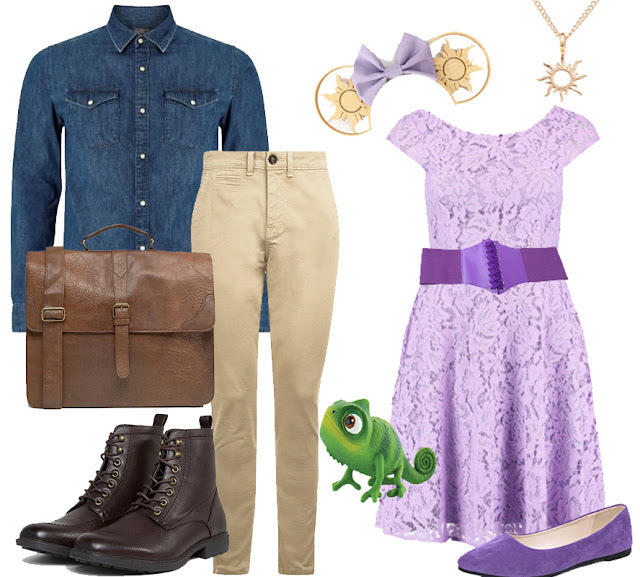 Tangled is one of my favourite Disney pieces and I think the costumes lend themselves very eaily to being watered down for bounding. My bound will be put together of a mix of purples and textures. This lace dress will be super comfortable paired with flats (try to wear them in before your trip if you get blisters easily, and keep plasters to hand just in case!) and the lace up belt is a simple but effective nod to Rapunzels corset top seen in the movie. The pascal toy is not a must, of course, but will make a great prop for photos and the custom made ears featuring the sun design really pull every together beautifully. Fantasyland will make a great backdrop for our Flynn and Rapunzel bound photos - I'm so excited to see how they turn out! Probably a less recognisable bound, but this is actually the one I am most excited for! 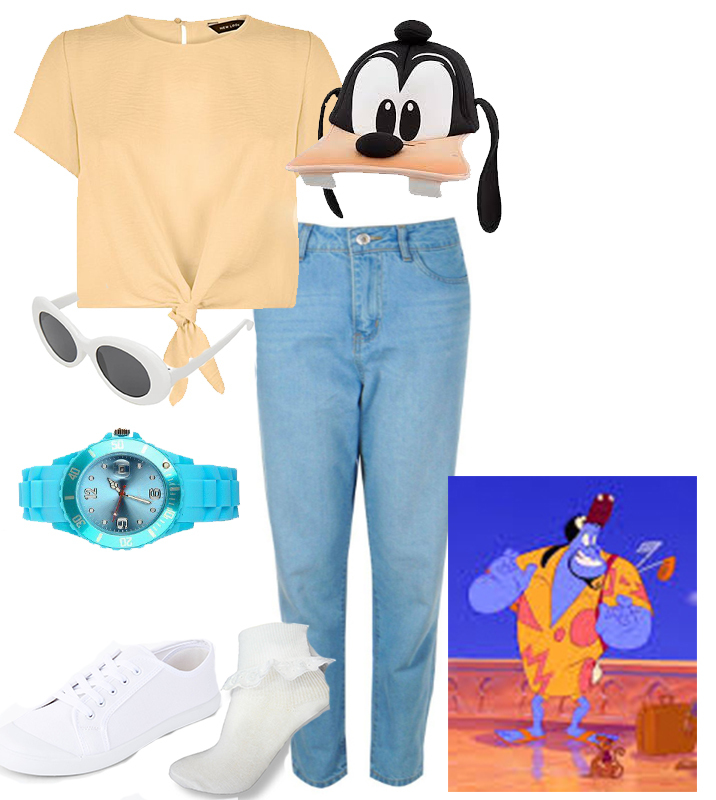 The Genie is one heck of a character and his vacation get up is so quirky and fun - and allows me to do some customising. I will add the geometric pattern to the shirt using either an orange fabric paint, or fabric cut-outs, I am undecided at the moment! As we will be travelling in Springtime, I also knew that the matching shorts would be a no-go so I've settled on an early 90's staple instead - boyfriend jeans and tennis shoes! The Goofy hat is a little hard to find here in the UK but it occasionally pops up on eBay, or can be shipped over from the US Parks - again, I'm keeping my bounds inexpensive, so there is room to splurge on the odd accessory if a bound calls for it! There are some great photo spots for this bound around the Agrabah area in Adventureland so I'll be sure to snap lots of pictures of this bound there! Since posting this bound to Instagram I have also been told it would work well for Mary Poppins - so keep it in mind if you're looking for a bound! Main street USA is one of my favourite parts of Disney; it's iconic with its quirky, vintage shop fronts, it has a great soundtrack and it has the best bakeries! I knew I wanted to try a bound inspired by this whimsical place and luckily Dan is also a fan on dapper style, so I think he is on board for this one! 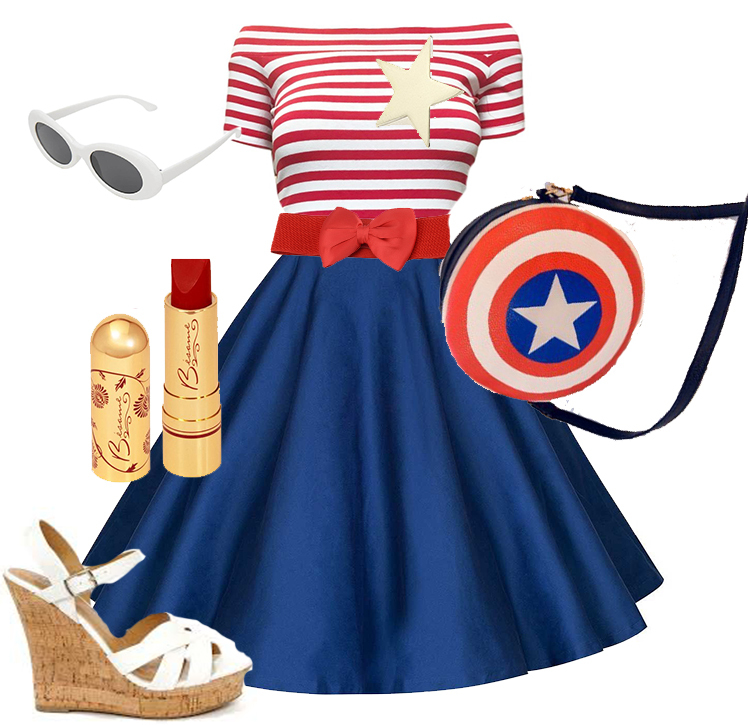 The ladies bound features this darling striped dress, matched with wedge heels (used for my Captain America bound), finger gloves and the cutest little straw boater hat! The lace umbrella will make for great photos and the red bow (also used in the Captain America bound) makes the dress super flattering. A white cardigan will work perfectly if the weather turns a little chilly on the spring evenings. 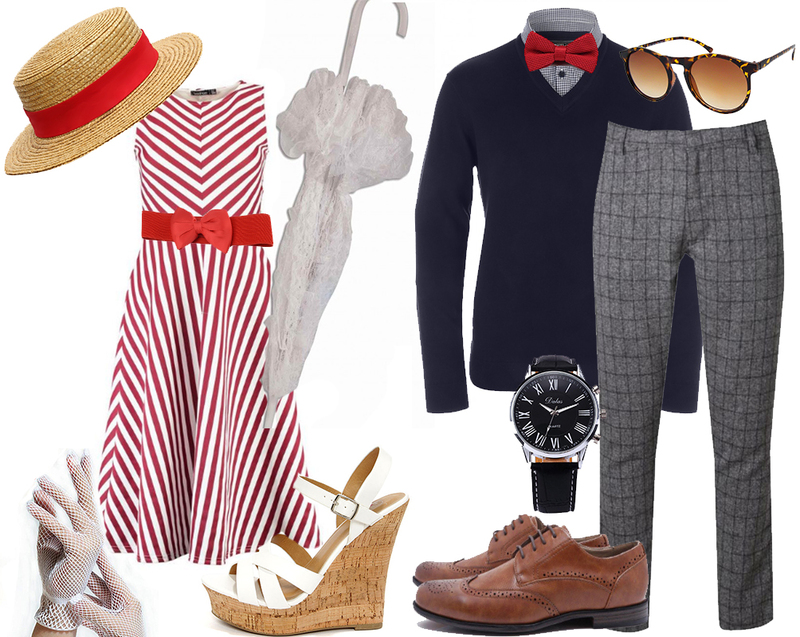 The gents bound is super trendy and I can't wait to snap some pics of Dan wearing it in the Dapper Dan's barber shop and along Main Street USA! The mock shirt jumper will be cosy as well as comfortable and the vintage style leather watch and sunglasses really pull on that vintage vibe. You might notice that I source a lot of my bound accessories on eBay, and the like, and it is simply because I know that I wont be wearing them again (or often), so I like to keep them as cost effective as I can. Elias has really started to love The Incredibles movie, and with the second installment due to release this year I predict it will become very popular again so I thought a family Incredibles bound might be fun to do! 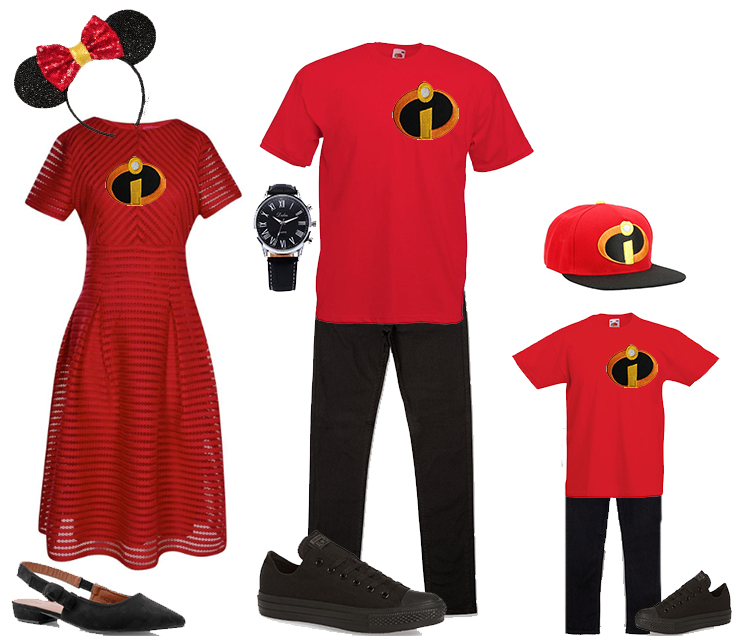 The boys will be comfortable and cool in jeans and t-shirt combos with the signature Incredibles logo stitched on and a couple of accessories, while I wanted to get a little more dressed up in this gorgeous red dress, finished with crystal tights and the Disney staple - mickey ears. These ears are quite plain too, which makes them versatile and usable for a few different bounds! Mr and Mrs Incredible make periodic apperances in the Disney studios for meet and greets so I'm hoping we will be around for that, as it will make for great photos! I am really looking forward to putting these bounds together, I'll be sure to update you with my progress - and of course, I cant wait to wear them on our trip! .RE-USE ITEMS; Disneybounding is great but can take up a lot of suitcase space and when you're restricted to a luggage allowance you need to make the most of what you've got and use items for more than one bound. Plan ahead and be accessory smart! .KEEP IT COMFORTABLE (& PRACTICAL); even though you want to get some great snaps of your bounds, remember that you do have a whole day of park adventures in front of you so it's important to wear things you will be happy to keep on and be comfortable in all day long - some days even for 12 hours! .KEEP THE SEASONS IN MIND; Last time I learned this the hard way! I had put together some fun bounds but they just weren't weather appropriate so I ended up having to layer up and my bounds didn't have the overall effect I had hoped for. Remember when your trip is planned for and design your bounds with the weather in mind. If you're bounding between seasons (winter/spring) then be sure to plan layers which will compliment your outfit, not just cover it - and likewise, if you are bounding over summer then make sure to choose things that you wont over heat in, you'll be doing a lot of walking and don't want to end up feeling hot, sweaty and having an un-enjoyable time!